In the first instalment of this series, “Fight Marketing Fatigue Now,” we discussed the challenge of improving relevancy and the varying degrees of personalization that exist within marketing organizations today. 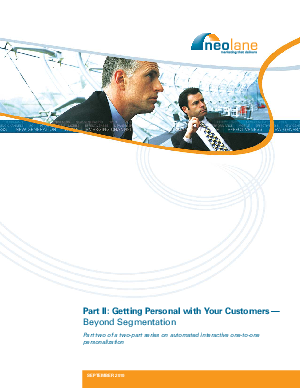 We made the case for a new approach, interactive one-to-one personalization. In this paper, we discuss how to achieve the related benefits including improved customer engagement, increased ROMI and measurable business value.